Raise a Green Dog! 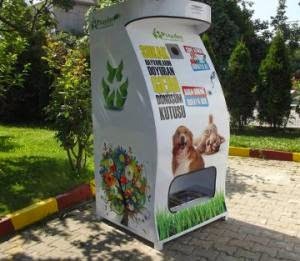 : Kiosk in Turkey helps both stray dogs and the environment. Kiosk in Turkey helps both stray dogs and the environment. Earlier this year a Turkish company introduced an interesting product that helps feed stray pets and helps the environment! Pugedon developed this product because in Turkey over 150,000 dogs and cats are living on the streets without food. In addition, drinking water from the tap isn't as safe as it is in the US, so bottled water is very popular, providing an overabundance of plastic water bottles that contribute heavily to their landfills. With Pugedon these bottles can be recycled to help the stray dogs all over Istanbul. It's a metal kiosk that works with an integrated solar system. 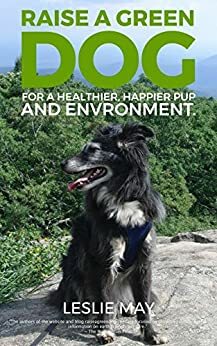 Individuals place their old water bottles in the machine and it recycles them into dog and cat food, dropping down food when the bottles are placed in the unit. They can also pour some of their water into the kiosk and provide needed water to dogs and cats, as well. The Pugedon Smart Recycling Boxes operates at no charge to the city, and the recycled bottles cover the cost of the food, creating a kiosk that dispenses help for both the environment, and cats and dogs.